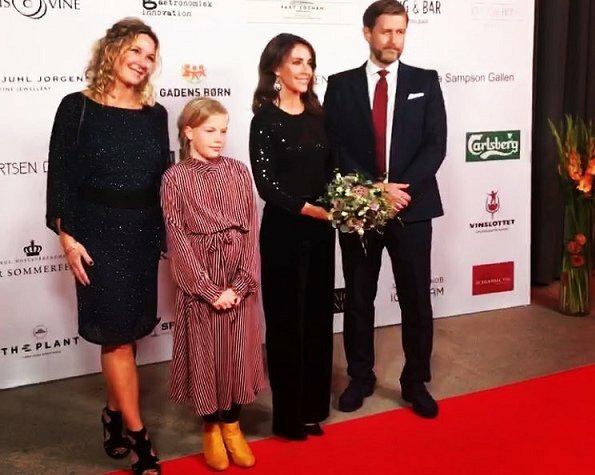 In the evening of September 29, 2018, Danish Princess Marie attended the charity gala held by Gadens Børn at The Plant CPH for the purpose of helping homeless children in India. Gadens Boern makes an effort to improve living conditions of homeless children in Calcutta city of India by supporting the initiatives in the fields of education and care. 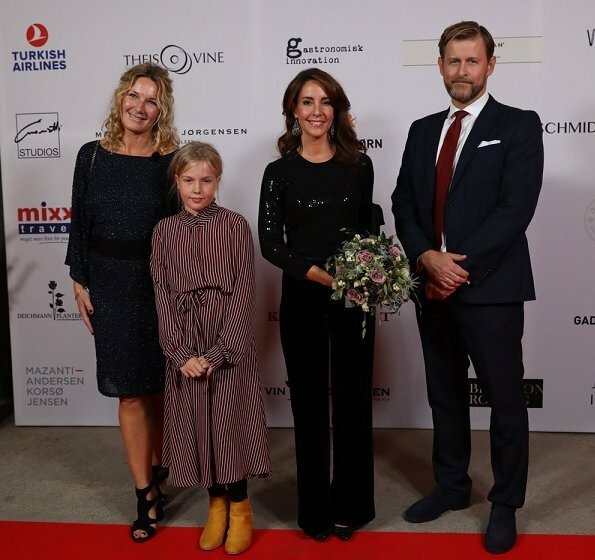 The whole income gained in the gala will be used in projects like preschools and day care centers for homeless children in India and will be donated to more than 400 children receiving education in different schools. Today's charity event attended by Pss Marie is a worthy cause. Marie looks wonderful. Here I tend to disagree, her dress (or trousers? I cannot really see) is too strict, not attractive. You can see it's trousers, in the third photo. I think the diamond chandelier earrings are too much here. I think her outfit is ok but her make up and hair style are perfect. Nice silhouette, good fit, but too dark, too much black. And who dressed that child? That´s a terrible outfit for a young girl. Pss Marie's earrings are a wow,very nice. Her outfit is good too. I think her attire and entire is extremely classy and chique. A much better choice that all of the busy florals and ruffles that we have seen lately -- makes you dizzy just looking at them. Perfect choice in my humble opinion. And the pants versus a long dress adds just a edge to the ensemable. Beautiful ad understated. Agree as well. Classics are timeless. She always adds an interesting top or jacket to her pants. She has become one of my favorite royals. I like Marie's outfit today, much better than usually. But I think we should not judge the dressing of children the way this young girl's outfit was criticized here. Another comment I agree with! Love her simple elegance. Would like the jewelry, pants, top and shoes in my own closet! I just love it! Marie is beautiful from inside and out! Hmmm. So much black. And the earrings (whilst beautiful) seem more appropriate for a black tie gala. Nothing terribly wrong in the end, but can’t say I love it. Bit disappointed.